Home / Homeground and Fresh! creating a healthy homeground flour. Yesterday I watched my 15 year old daughter cut herself a thick slice of freshly baked bread, peel off the crusty edge and eat it. Then she tore off bite sized pieces of the soft middle and popped them into her mouth. The ate the bread plain, not needing any spread on it. I marvelled at how healthy she looked despite her erratic eating habits. Being a teenager Thea often chooses to eat food I consider to be ‘dead’ food – food far removed from nature and often containing man made substances to make it look nice and last longer. I am very grateful when I see her eating something as nutritious as the bread I make. I make bread from freshly ground, chemical free wheat and other grains. Before our daughter was born my husband and I responded to an opportunity to buy a small flour mill. As we were a single income family with two young children the outlay seemed expensive at the time. Looking back now we see it was an excellent investment in the health of our family. This is the story of how this chance purchase went on to play a big roll in our developing a healthy life style. Nutritional value of grains, seeds and nuts. A grain of wheat is alive. If you plant it under the right conditions, it will grow and provide you with many more grains of wheat. All whole grains, seeds and nuts are cleverly designed by God to be suitable for storing for a long time without deteriorating. Life energy lies dormant in each, waiting to sprout forth or be used as life preserving food. Once you grind them however, the life giving energy begins to fade. One of the ways to transfer the vital energy from these natural foods to our bodies, is to eat them within a short time of them being ground. It was a hand mill which was great – we could use it even in a black out. However, to grind fine flour the stones have to be close together and that makes grinding, using a handle, quite hard work. By loosening the tension on the stones the resulting coarse ground grain is wonderful for porridge. That is how we mainly used out mill in the beginning. It was fun experimenting with different grains to create new and different recipes for breakfast. Instead of offering the children rolled oat porridge or packaged cereal, the choice that our children were presented with each morning now included – cracked wheat porridge with golden syrup and cream, barley porridge with sultanas, rye porridge with raisins and rice porridge made with milk, honey and cinnamon. I would grind the grain of choice freshly each morning. At one time I was supplying a mother of triplets with freshly ground rice porridge. She believes that rice is the easiest cereal for babies to digest. She was keen to start her babies on the best solid foods she could procure. Primitive man lived on seeds and nuts, raw and untampered with. When the art of cultivation was acquired, grains became the staple food all over the world. In Asia it was rice; oats in Scotland; rye and buckwheat in Russia and East Europe; millet and sesame seeds in the Middle East; corn in Mexico and Central America; and wheat in Europe and North America. The nutritional value of grains and seeds is impressive. They are a gold mine of minerals. They contain most of the vitamins, particularly A, B and E. They are nature’s best source of unsaturated fatty acids and lecithin. And they are an excellent source of protein. Recognising that the increasing poor health has a lot to do with what people eat, world-famous nutritionist Paavo Airola in his book “Are you confused?” wrote about the health building, health restoring power of seeds, grains and nuts. He claims they are the most important and potent foods of all. He also quotes scientific research that claims that there are valuable substances in these foods which are unavailable in other foods. These substances are highly effective in preventing disease and maintaining optimum health. He reminds readers that only whole fresh unrefined grains and seeds contain all these substances. They are largely destroyed in processing and refining. As Airola says, you can’t benefit from them by eating packaged breakfast cereal or white bread. Fortunately our Little Ark flour mill was equipped with bearings which made it suitable for motorisation. We bought a couple of pulleys and a fan belt and my husband David connected the mill to an old washing machine motor. We considered connecting the mill to an exercise bike as legs are stronger than arms, and we could get fit at the same time! However, as we came by the washing machine motor first (and we didn’t ever find a second hand exercise bike) circumstance decided the matter for us. As it was now easier and less time consuming to make flour, my cooking received a new burst of creativity. 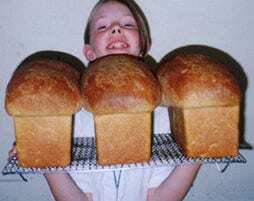 The smell of fresh baked bread wafting through the house became a challenge for Thea and her two older brothers to guess what grains were in the fresh loaf . I also made our own fresh pasta, cakes, biscuits, pastry and pizzas.Fresh flour as a thickening agent for stews and gravies is another way I use one of the best natural ingredients. A kernel of wheat consists of three parts – the bran, germ and endosperm. The germ and bran contain organic phosphates, which provide brain and nerve food and calcium for bone and teeth. Consumption of the complete kernel is necessary in order to receive the full value from wheat, especially the trace elements so essential to human nutrition. Known vitamins and minerals in a wheat kernel. We were hooked on this easy means of ensuring that an important part of the food we ate was the best we could provide our family. Thanks to our little mill, the grains we ate were natural, healthy and alive with nutrients – just as Nature had produced them. Nothing is lost from the grain when ground slowly between stones. The metal rollers used by most commercial mills today get hot and unfortunately the heat destroys some of the vitamins found in wheat grains. With stone grinding the entire kernel is ground spreading the germ evenly throughout the flour. The roller milling method removes the germ and the bran from the endosperm. Wholemeal flour produced by roller mill, is the endosperm with some of the extracted ingredients added back. The wheat germ for example, is generally not included. Enriched white flour is the endosperm with a few synthetic vitamins and minerals added. Bleach and preservatives may also be added. The stones however, are only suitable for grinding dry grains such as wheat, rye, barley, rice and buckwheat. If we wanted to grind anything containing oil, such as nuts, corn, sesame seeds or sunflower seeds we needed to obtain a mill which had metal burrs. And this we did. (Today the Retsel Little Ark Convertible has stones and burrs so only one mill is required.) We were now able to stock our pantry with more whole foods, chemical free and with their full quota of nutrients. Soy beans became an important part of our store of provisions in case of an emergency. By grinding soy beans we could make soy milk and butter. Treats made from freshly ground whole nuts became a favourite delicacy for all five of us. The concept of being able to grind grains, seeds and nuts freshly, at home, was such a good one we decided to promote the idea in our local farming community. We felt that many more people would be interested in doing the same if only they knew that the mills were available. We wanted to demonstrate how easy it is to grind the grain just before it is needed for cooking. We could also show people how we successfully stored our bulk grain with minimum effort. We decided to invest in the larger Retsel Milrite so that we had three mills to demonstrate. We then booked a space at the local agricultural show. At the show we demonstrated the mills and handed out samples of freshly ground grains with recipes to go with them. Much to our delight, mill sales resulted from our initiative. We did this for several years until we felt that we had satisfied the local market. People still remember our stall. Only last week I had a call from a local shop keeper who said he had a customer with him who was asking about domestic flour mills. It was the homeopathic doctor from a neighbouring town. As well as being keen on avoiding chemicals in food he also grows unusual grains which he wanted to grind at home. He mentioned that there would be an increase in people interested in obtaining fresh grains following the visit to our town of Dr. Sandra Cabot, author of ‘The Liver Cleansing Diet’. Unlike the Little Ark which requires bolting to a steady surface, the Milrite has a motor is built into it, making it easily portable. This opened up new opportunities to introduce people to the possibilities of grinding grains freshly. I used to take the mill to the Pre-school kindergarten my children attended. It was delightful watching the children’s interest in seeing the grains being ground into flour. They tasted the flour and many would return again and again for another taste as if there was something in the flour which their bodies were craving. I had white shop bought flour for them to sample as well so that they could taste the difference. Freshly ground flour made from the whole grain tastes nutty and flavoursome, whereas white flour tastes more like talcum powder than food. I took the fresh flour and made it into dough for pasta. With the help of the children, we rolled it into flat sheets and then cut them into strips which were cooked by the staff. You can imagine the excitement when it came to eating what we had made. As our three children grew so did the opportunities to use our mills. At the primary school fete we had a pancake stall where we ground the flour freshly for the most delicious pancakes. The portable mill also enabled us to lend our mill to friends so that they could have the experience grinding grains. Chemicals are sprayed on the ground to prevent weeds from growing; sprayed on the crops to prevent fungus and insect attacks; sprayed into the storage systems to prevent further insect attacks. Preservatives are added to extend shelf life. Bleaches are added to make white food whiter. The list goes on. People generally are eating an increasing amount of chemicals in their daily food. “Mental retardation, dental disease, arthritis, alcoholism and possibly even cancer, can be blamed on the poor internal environment which the cells and tissues of our bodies have to live with.” wrote Vikki Peterson in The Natural Food Catalogue. All those nutrients essential for a healthy robust, disease free, internal environment can be found in freshly ground wheat!!!!! This year we couldn’t resist adding a revolutionary new home flour mill to our collection. It is an exciting example of what can be developed with new technology. This latest addition is called the GrainMaster Whisper Mill®. uses a new revolutionary means of milling the grain into flour called Advanced Microburst® Technology. The heart of this new mill is a patented stainless steel milling chamber with concentric rows of stainless steel teeth. All the stainless steel is surgical quality. Grains fall by gravity into the centre of the milling chamber. Then, as the grains are propelled by centrifugal force to the outside of the milling chamber they collide with the surgical quality stainless steel teeth. During this process, as the term ‘microburst’ implies, the grain bursts into smaller and smaller particles. The result is fine fresh living flour. The stainless steel teeth do no touch each other so this method of milling has all the advantages of the older stone grinding mills, in that there is no heating of the grains and there is nothing lost from the whole grain in the process. However, the Grainmaster Whisper Mill® is a more modern looking kitchen appliance and is much faster. Whereas the Milrite takes 5 minutes to grind three cups of flour, the new machine does it in 40 seconds! This new mill is also excellent for grinding soy beans. Over the past 16 years our family has been regarded as ‘alternative’, ‘unusual’, ‘going against the normal trend’ because we grind our own flour. And yet a homeground flour, in this complex age, it has been our way of keeping connected to an aspect of life that is simple and natural. It has enabled us to ensure that at least part of our diet is as ‘pure’ as we can get it. So it is with great interest that we watch what may be a revolution in the flour industry. With the advent of this new machine it is now quick and easy to grind your own flour. ‘Quick and easy’ those words which have so much appeal these days. It may well be that the Microburst technology has bought the grinding of grain around to a full circle. Since time immemorial, humankind has made flour by grinding grains between two stones. Originally the grains were collected and ground by hand. When man learned how to cultivate grains, something bigger was required to grind them. Until about 100 years ago the farmer was still taking his wheat to the local mill where it was ground between two large stone wheels. Water, wind or large animals were often used to turn the heavy millstones. These mills were slow and had limited output.The flour was fairly coarse but it was fresh and nutritious. As cultivation techniques lead to larger quantities of grain being produced, again another development in milling was needed. Steel roller mills took over the roll of milling nearly all commercial flour. This large complex machinery can separate the wheat into its components of bran, wheatgerm and endosperm. The positive outcome was that there was a greater variety of uses for wheat products. The negative aspect was two fold. Firstly, the heat generated by the metal rollers destroyed the more sensitive nutritional elements of the grain. Secondly, bread generally no longer contained the whole grain in its perfectly balanced proportions. White flour is made from endosperm which is the bulky carbohydrate portion of the grain. It contains little in the way of the minerals, proteins and vitamins. And yet white bread became a status symbol. This is an example of the trend which developed and became so detrimental to the health of our societies. The increased sophistication of technology facilitated people being able to choose what they ate, with their minds. Developing our mind is part of our evolution. In doing so, we have, to a large extend, become out of touch with our bodies. We no longer ‘hear’ what our bodies are telling us. Our minds know best – or do they? Perhaps the increasing popularity of bread machines will pave the way for the idea that it is beneficial to grind your own flour. Bread machines are quick and easy. The family can control what goes into the bread. And now, as a companion to the bread machine, Microburst Technology enables the home bread maker to use the very best quality flour. They can enjoy the consequent health benefits that people enjoyed before the advent of roller mill technology. When our family installed a simple little four mill in our laundry 16 years ago we had no idea of where that first step would lead us. It became a catalyst for focusing our attention on healthy eating in an easy, unfussy way. It gave us a means of introducing our friends and community to these ideas. It lead to us eating a greater variety of food which was alive with vital energy and valuable nutrients. We were able to ensure that a major portion of our daily food was chemical free. As a result, much of the food we bought was unprocessed and often bought in bulk. Thus our mill enabled us to buy our food more cheaply. Having a milking cow can improve the quality of the food you provide your family in much the same way. However, a mill does not need to be milked and fed each day. The calf does not have to be separated from its mother. There are no veterinary fees and we don’t need to ask the neighbours to look after it when you go away! Penny Gibson, PO Box 561, Young, New South Wales, Australia.